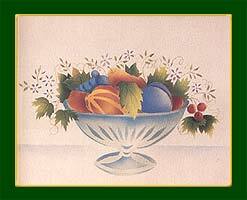 Theorem Painting is an early American Decorative Technique that dates back to the first half of the 19th century. The word Theorem suggests, according to Webster's New World Dictionary, "an expression of relations in an equation or formula." As such, the cohesive composition is acheived through a series of stencils cut in such a manner that no two areas immediately next to each other can be placed on the same stencil . Thus, any theorem will require the sequence of two or more stencils or overlays. This technique was popular among women of all ages during the early 1800's. It was an art form practiced by women of means. It was part of the curriculum in the girls finishing schools during the Victorian Era. That tradition still holds today…...women of all ages gathering together to produce these beautiful works of art, much like women gathering for quilting. Its primary attraction, then, as today, is the fact that it enabled the average non-professional artist to create acceptable art-forms for their own use. Although Theorem Painting has had a long history on both sides of the Atlantic, it has remained somewhat obscure and antiquated. Except for sporadic revivals, Theorem Painting has never reached its fullest potential. This is largely due due to the scarcity of published pattern material. Thus, this technique has only flourished locally, mostly in Connecticut, Massachusetts, New York , Pennsylvania where the techniques have passed from generation to generation and from teacher to student. Most of the design material leaned toward the primitive side, many copying the old patterns. As a result Theorem Painting has generally been classified as a colonial period craft or art-form and was usually done on cotton velveteen or watercolor paper. It has been my goal ever since my first book, Touch of Velvet I to rectify this situation by offering a more contempory, realistic and diverse approach with updated supplies and techniques. I feel that Theorem Painting can be moved out of the realm of the colonial period and take its rightful place in the 20th Century Decorative Arts. In this respect Theorem Painting can be viewed as unique, yet versatile art-form. 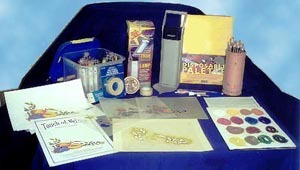 It gives the present day artist the opportunity to CREATE through the use of stencil overlays, a work of art that is acceptable by todays standards, yet also preserving the early principles of Theorem Painting, an almost forgotten technique. In the seventeen years since I wrote Touch of Velvet I, we have seen so many changes take place. At the same NSTDP trade Show where I introduced Touch of Velvet I, the Shiva Paintstiks were introduced. Our newly published technique book seemed obsolete, I came away skeptical and devestated . I put my sample Professional kit away in my paint cupboard. Would this new solid form of oil paint work? Would they stand up over time? Would they take off with the consumer? It was so easy, would I ever teach again.? A few months passed before a needlework salesman brought the Paintstiks to my attention again. He was successful in convincing me. Before the day ended we had several walls in our store stenciled using the new solid form oil paints. We set a table up in the front of the store for free demonstrations. We were off and running. I also, made a few changes in technique as to how the stiks would be used.Initially, the manufacturer suggested applying the stiks directly to the stencil, then taking a brush and brushing the paint onto the open area of the stencil. I decided that the decorative painters would probably be more acceptable of this new technique if we set up our disposable palettes just like we set up our palettes with the artists oils. So the technique, of rubbing approximately a 3" circle out for each color in the color progression needed from light to dark on a Tara Disposable (parchment) palette started. Up to this time, we applied the paints with our finger covered with a small square of wool or velveteen. Within a short time of Paintstiks appearing on the market. Loew-Cornell introduced the Jo Sonja Stenciler, a super new white taklon brush, very soft and very dense. The Paintstiks loaded beautifully on this wonderful new brush. We were able to achieve an "airbrushed look" without all the expensive paraphenalia. The same needlework salesman introduced me to a new cotton flocked Bristol Board . This was what we had been searching for! This product was low cost, needed only to be cut with knife or scissors, stenciled and framed.The very labor intensive, unhealthy preparation of the cotton velveteen mounted with spray adhesive was eliminated. This surface is now made for us under our Trade Name of Velour Board. Again, all the questions that were asked about this new form of oil paint were also being asked about this new surface. We were honest in replying, that we did not know,only time would tell! We can now say after seventeen years that it is very satisfactory. It was early in the eighties, when the larger stencil companies, like Stencil Ease and Plaid introduced die-cut stencils for mass production in the craft market. Die-cutting was very expensive and cost prohibitive for the small one person companies. Most of us in Theorem field were still hand tracing and hand cutting. Our designs were offered as pattern packets which consisted of a numbered line drawing and a photograph. It was a student that needed a baby gift the next week that was the motivation behind the creation of our "Hold on to Your Heart Stencil"(the beginning of our timeless bear collection.) "Gift of Love " is probably our all time best seller. It was the popularity of this bear collection that launched the beginning of our Touch of Velour Theorem Kits. It was sometime in the mid eighties that Jean Hansen Publications decided to offer a preprinted multilayered Theorem kit, eliminating the hand tracing. These were packaged in a zip lock bag and included the numbered stencil design printed on four sheets of stencil vellum, instructional sheet, velour board and a cover sheeton which had the Photo glued to it. It was 1989 or 1990 when we were first introduced to the new laser cutting technology. It looked too good to be true. We had "Gift of Love"and the "Canvasback Duck "laser cut as samples. We thought we were in heaven!!! Up until this time , a three hour Theorem class consisted of two hours of cutting and maybe one hour of actual stenciling. We knew that a certain number of people in each beginning class were turned off when they had to hand cut a stencil. Even though I used to preach that the true art form was in the hand cutting of the stencils. In recent years I have had alot of people remind me of this fact. Needless to say , we had a lot of thinking and pondering to do. Of course, more questions. The main one being ,would the student and consumer pay the extra for a laser-cut stencil.? Classes would have to be taught differently, may be not so rushed. We could spend more time on stenciling techniques, finishing details and maybe framing. We made the decision to give it a try. We bought a computer, leased a color copier, and was one of the first , if not the first Theorem Designer to have a laser cut kit, complete with instructions, large colored picture, (one away from the original ),and a velour surface all in one neat package. Perfect for class situations, neat for the consumer. Put out the paints and brushes! The theorem artist was nearly assured of great immediate results. I owe a great deal to my Westbrook, Connecticut Students who got to try each of these designs as they were released.Their feedback has been invaluable. We only meet once a month now as we live two hundred plus miles away. Our student base has increased, however, and we now do classes all over the North East!